As a newer climber, while working with a guide, it can feel like the guide knows everything there is to know about climbing. Generally speaking, many guides do become experts on their home areas and do have significant technical knowledge. However, even really good guides don't know everything. Professional development doesn't ever stop, and sometimes guides even need the assistance of other guides. Some guides are a "jack of all trades" and are good at all things climbing, but most are experts in one discipline or another (rock, alpine, technical systems, ski, etc). Personally, I'm a bit top heavy in the rock and ice department, and feel like I lack good skiing skills. I haven't skied that much, and I don't really have much experience assessing snow conditions. I like being an expert at climbing. It's hard to ski more when there's perfectly good rock or ice to climb. Getting better at skiing is a goal of mine though. 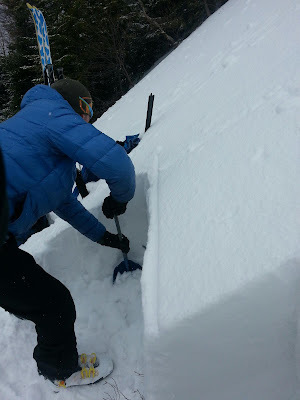 I approached IFMGA Certified guide Silas Rossi, a friend and fellow guide, a few weeks ago and told him I'd like to ski and assess snow stability with him for a day or two this spring. The following week we met in the Adirondacks for some fun. After a casual start we were on our way into Johns Brook Lodge and the Orebed Trail. Before long we were sweating our way up the creek bed below Gothics North Face. Near the base of the face we dug a snow pit in order to document a complete snow profile. 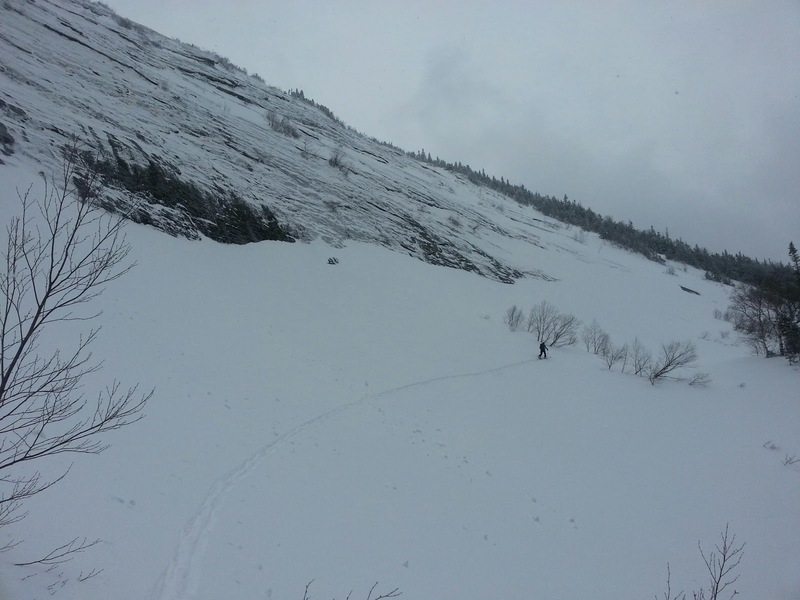 Snow stability wasn't an issue, but I was here as much to refresh my stability assessment skills as I was to ski. Silas teaches the AIARE Level 1 and 2 courses throughout the northeast, so his knowledge and feedback were immensely useful. After a few hours of digging, observing, recording, and chatting about our lives we decided to do a little skiing. We skied down from the face and into the creek bed. Silas skied with very gracefully. I thrutched and wobbled my way down, managing to stay on my feet the whole time. Success! 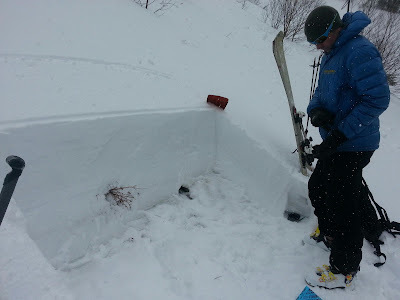 The shaded side of the pit becomes a "reference wall"
Watching Silas ski so aggressively over and off the pillows of snow in the drainage gave me the confidence to ski things I would otherwise have circumnavigated. This is how we learn and gain confidence. By shelving our irrational fears we're able to perform better. This is the beauty of working with a guide. They help you become comfortable in what feels like a foreign, and potentially dangerous environment. At the end of the day we chatted more over beer and nachos at the Ausable Inn before parting ways. We discussed the state of our young US guiding industry, future climbing plans, and our amazing partners (wives and girlfriends) who stoically spend days, weeks, and sometimes months away from us as we travel to guide and to climb away from home. 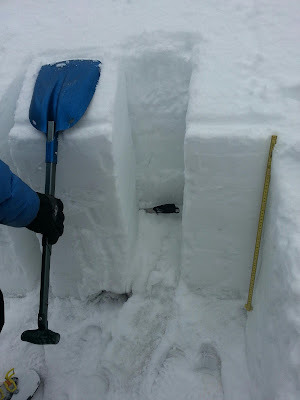 Looking back on the day, I see now that the day helped me solidify my snow stability assessment skills as much as any avalanche course has, and that skiing with people that are better than me is the way to improve. If you are looking to improve your skills and gain confidence as a climber or skier consider hiring a trained and certified AMGA guide to help you with your skills.